We would like to meet up to chat about what you can do to safeguard our rivers and save the Mackenzie country. 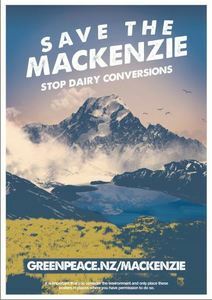 As you may know, right now, a wealthy accountant from Dunedin has approval to convert a huge area in the Mackenzie to a massive industrial dairy farm. He plans to put 15,000 cows at the Southern end of the picturesque Lake Pūkaki. The new Government and Mackenzie District Council must take decisive, effective action to save the Mackenzie country.